It was raining cats and dogs in more ways than one yesterday at the Museum of Flight. 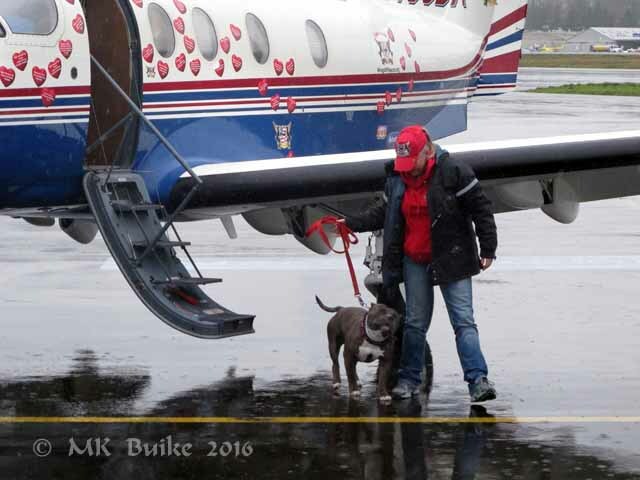 Feather and I had arranged to meet up for the "AirMail Valentine Doggie Delivery with Wings of Rescue"
Due to the foul weather, the arrival of the several aircraft was delayed until 1500. We'd arrived at Museum opening, 1000. Thus, we had a few hours until the event. Of course, we sketched! I've done a lot of sketching there. I decided to go up to the WWI gallery as I've sketched there the least. My first choice was the Museum's reproduction of the Nieuport type 24 bis. 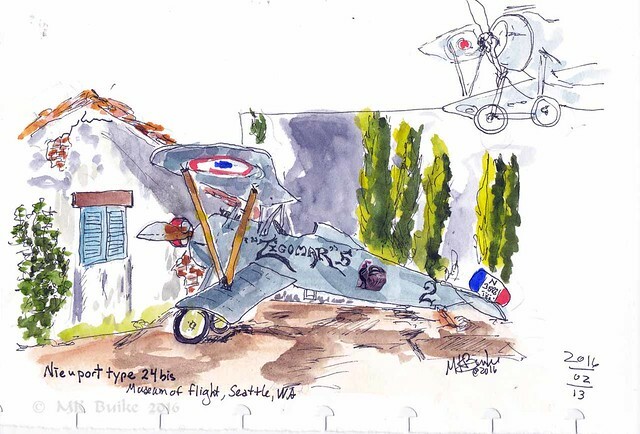 This is a French aircraft but it was used by many nations. Feather chose to sketch the frightening visage of the Lockheed M/D-2 Blackbird. 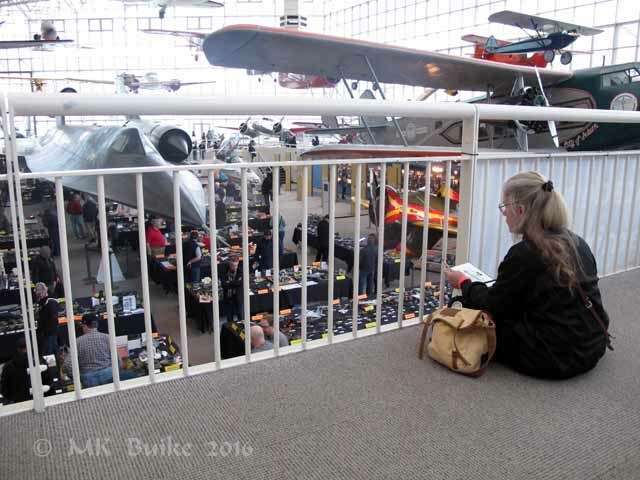 (set out below the Blackbird are the displays of the Northwest Modelers' show, also there this weekend). Back for more sketching after lunch. I roamed the NW Modelers' show in the well of the Great Gallery. But when I saw Pat working on the wiring of a model of the starship Enterprise, I had found my next subject! Finally, right at 1500, the first aircraft arrived. It was pouring rain the entire time they off loaded about at least a hundred cats and dogs... hence my title. Five aircraft arrived but two had to turn back due to the weather. The arrival was so late they did not bring any of the animals into the museum as had been originally planned. So we didn't get to sketch them as it was far too wet outside. They carried them directly to the waiting shelter vans. We had a good time despite being soaking wet and cold after 1.5 hours outside with the dogs! 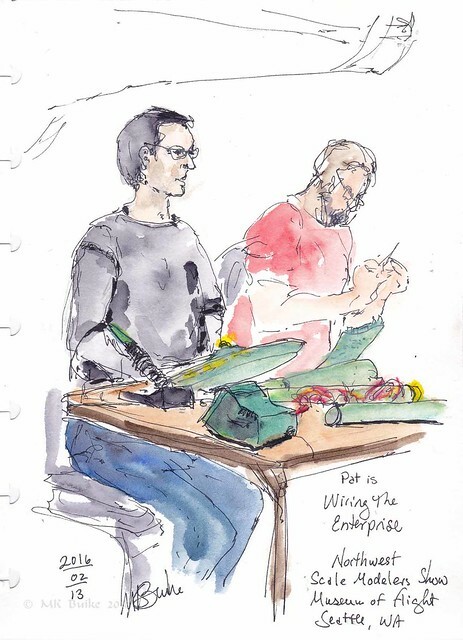 Wow, great sketches at what must have been a very fun event (despite the rain)!